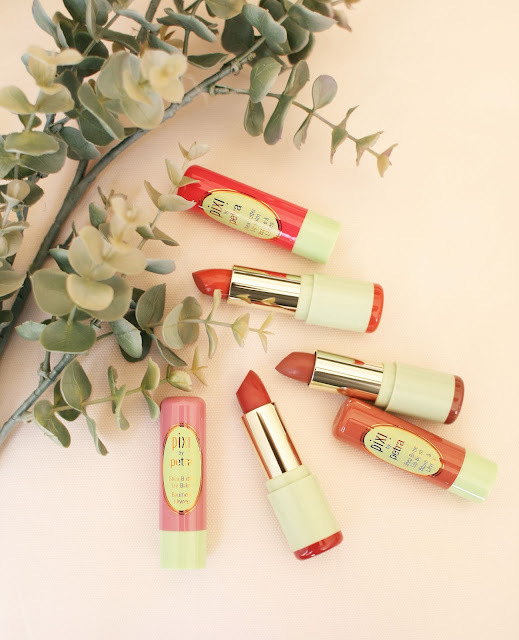 I have a rather quick post for you today with some lovely lip products from Pixi. They kindly sent me 3 Shea butter lip balms and 3 mattelustre lipsticks, and I thought they would be a great gift idea for dare I say the C word.... Christmas! I can't be the only one thinking about the fast approaching festive season? You can never have too many lipsticks/lip balms and theses would make lovely little stocking fillers. The balms are $8 and the lipsticks are $12! Shea butter lip balm* | A nourishing lip balm infused with Shea butter and vitamin E to give lips all day nourishment and protection. Perfect for everyday wear as there is just a hint of color, I find them perfect for after a workout session too so I can run to the store looking half decent, anyone else? Mattelustre lipstick* | A long lasting full coverage lipstick that won't dry your lips out after a few hours of wear. Mattelustre so this product has a Demi matte finish which is perfect for long days of make up. Infused with peptides, hyaluronic acid and vitamin C + E of give lips a fuller smoother appearance. My fave shade is Peach Blossom FYI!